I recently attended Microsoft Ignite 2018 in Florida which presented many new useful features and function for Office products. 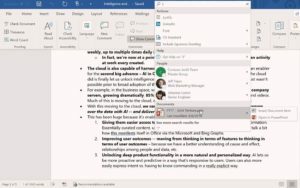 Microsoft want out of its way to show of the Artificial Intelligence that is built into desktop Word, Excel, PowerPoint and Outlook. The coolest new Office feature demonstrated at Ignite 2018 was a simple but powerful suggestion to move text lists into dynamic graphics using Microsoft’s Artificial Intelligence. For instance if you have a list of 4 dates, Microsoft will suggest (and do the work for you) using SmartArt. At you command it will automatically convert boring text to cool smart art that you can fully customize. 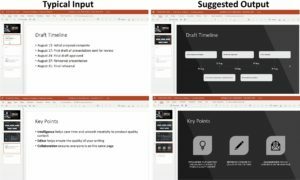 A new IDEAS pane is coming to applications like PowerPoint that will provide not only the DESIGNER pane suggestions we have today but also graphics and text from other documents and the internet. They are also using AI in in a dictate function. Dictation will get better the more you use it and it does support many languages. Another great new feature heavily relying on AI is the Consistency Checker. It looks for punctuation, formatting, hyphoenation and grammar inconsistencies. So when you use the past tense in most of your document but the current tense for the same concept in another part of the document, it will point it out to you. When you hyphenate a word in some places, but not others it will point it out to you. @mentions : “At mentions” were released for Outlook in 2017 but now they can be used in all Office products in things like COMMENTS. If you use the @ before someones name that is in your organization (i.e. 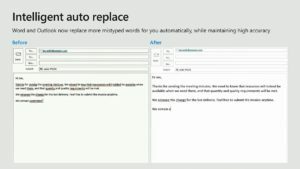 @ianmatthews) the document will automatically send that person an email indicating they have been @mentioned. This usually means the editor of the document is asking you to do something. The recipient of the @mention will be taken directly to the part of the document they were mentioned in when they click the link. This could be particularly useful for mobile workers that need to verify a number or statement in someone else’s document. @ToDo: “At Todo’s” are simple notations you can add to any document as a flag for you to go back and finish late. Currently the @ToDo’s do not appear in your Outlook TASKS list but they should in the future. Today @ToDo’s will show up in the document, in the new OFFICE APP and in the Office portal. The SEARCH BOX at the top of a document was improved in 2016 to provide links directly to functions (rather than just a text help file that tells you where to find it), but by the end of 2018 it will also include AI suggestions for other people (i.e. who has chatted the most about this topic, or who is listed as a subject matter expert), other documents you have access to and even clip art and clip content from he internet. The demonstration of this was far more impressive that I can put into words here. Word and Outlook will replace mistyped words with much higher accuracy than was done in the past, thanks to advancements in the use of Artificial Intelligence. There are a great number of so called Learning Tools for handicapped people and special use instances. Things like changing the background to black and having the text in white are now easy to use. For those with touch screens, inking has been seriously improved. If you strike through a word, it will be deleted. If you draw a rectangle, the new “Ink To Shape” function will be converted to a rectangle. If you want to get your ideas published to in a more consumable form that a simple Word or PowerPoint document, there is now a FILE > TRANSFORM function that will build and publish a SWAY webpage for you including the graphics at no cost and in virtually no time. You can then easily set the permissions on that page and notify who you want to read it. Sway will then keep statistics on who read it, how long they read it and where they appear to be most interested. There are several new functions in Excel that including a random number generator and most interestingly the ability to use full arrays with new functions like UNIQUE and FILTER. This is a bigger topic so we created THIS new article with a separate video just for the new functions in Excel 2019. Microsoft now recommends the 64bit version of Office be installed. There is no migration process from 32bit to 64bit so you can either rip and replace or do what Microsoft suggests which is to start simply install 64bit Office on all new installs. For more details see our article: Why Is 64 Bit MS Office Now Recommended? Office 2019 is the last version of Office that can be purchased without a subscription and it will be a standalone product that, unlike Office 365 Pro Plus, will not receive any feature updates in the future. Office 2019 will receive ONLY security and bug fixes. It will also ONLY be available with a Click-to-Run install and will not have an MSI. For more information on this read our full article on Office 2019. 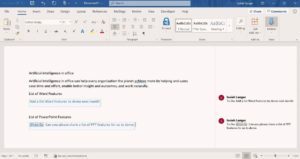 The online versions of Microsoft Office has had a lot of work done to it and we have a summary and video demonstration of those improvements HERE.